To enjoy the Colorado Rockies summer time, Outdoor decks create the perfect space for summer grilling, parties and will add visual appeal to any yard or home. Many of you may be asking, which material is the best for the high altitude and the harsh UV rays in Colorado? Great Question and we hope the following can shed some light for you. Selecting the material for your deck is almost as important if not more than the design itself. Talk with your contractor and keep in mind, from natural wood to composites, there are a lot of choices including color, texture, installation, and price. Here are the most common deck materials to choose from. Wood Decks – More common types Include Redwood, Pressure treated or hardwoods such as IPE or Tiger Wood are all great choices. Wood is strong, natural, and is beautiful, but it requires the most maintenance over any other decking material. Annual cleanings are required and wood decks must be treated and re-sealed/stained every two years. We have known Redwood decks in Colorado to last over 25 years if diligently maintained every year. Composite Decks- Composite decks are made from a blend of different plastics, waste wood fibers, and other materials which make it resistant to rot and decay. These decks most resemble and mimics the look and feel of wood. You can buy the color and the grain texture you want and there is no need to paint or stain them. Overall composites are more expensive than wood, but the only maintenance they need is an occasional gentle scrubbing using a deck cleaner and pressure washing to keep them bright and fresh looking. Any decks, wood or composites can be installed using clips, deck screws, or hidden fasteners for a seamless look. 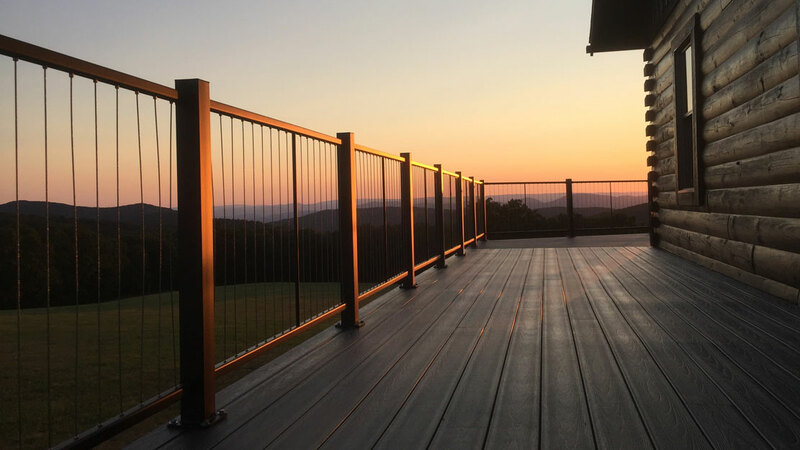 Fortress, Infinity, TimberTech, Fiberon, and Dekorators, are all industry leaders in composite decking, and between them you should be able to find a color, grain and style you like. Each manufacturer has a variety of levels to choose from, depending on the overall look and feel you are willing to pay for. They will all perform to a very high standard of durability. Finally as a “special longevity secret” for redwood decks to last longer than ever before. Ask your contractor to lay down a metal flashing type of material or butyl rubber type of barrier on your wood joists to keep the wood decking from directly coming into contact with the joists.